Sometimes I allow myself to slip into a reverie about my brewpub experiences of three decades ago. Those pints of amber ale and porter we sipped tasted impossibly complex and full of new flavors. We had never considered that a beer might not be fizzy, that it might have density and viscosity in the mouth. Until that time we didn't know what hops tasted like, nor roasted malts. There were, it is true, encounters with butterscotch, nail polish remover, and boiled cabbage--risks adventuresome beer hunters were willing to brave. In the main, though, we had the idea that we had finally seen what beer was, what it could be. In the former darkened world of Oly and Hamm's, we knew only 5% of what there was to know about beer. But a fresh new world had been laid bare. Sitting over an oatmeal stout, we were up to, what--eighty, ninety percent total knowledge? Easy. This came back to me as I was sitting over a reflective pint of Upright's Pathways saison at the Grain and Gristle last week. It is a wild saison the brewers put together from lots they find bubbling away in their barrel room; the result of blending, no two releases will ever be the same. Pathways is astonishingly good, but it's also, compared to that earlier Jeff who was dazzled by ambers, astonishingly advanced. Think of what has happened since then. In order to arrive at Pathways, we first had to discover wild yeast and bacteria, the twin banes of brewing that had been eradicated from our knowledge. But just knowing about these creatures did not allow brewers to make good beer. For a couple decades, brewers were knocked around by their yeasts and most wild ales were extreme and overly intense. It took brewers time to learn how to coax them to make gentler flavors, less acid and funk, and has taken even longer for drinkers to develop the aesthetic sophistication to appreciate these beers. Brewers had to learn barrel-aging; not just the act of putting wort or beer in oaken vessels, but what happens inside. Over years and decades, they learned about the biology of slow fermentation, of the factors of oxygen penetration, temperature, and so on. Finally, brewers started to apprehend the necessity of blending, in taking the very different beers that evolved in the ecosystems of individual barrels and combining them to produce a harmony of the different elements, like a symphony. Each Pathways blend is unique, as the barrels that comprise it all have an individual profile that evolves over time. Those casks may have one of multiple brettanomcyes or lactobacillus strains, light use of fruit, or other distinct elements. Each blend does have the common goal of crafting a saison with character and balance that extends for over a year of conditioning, in which young bottles show an attractive herbal hop profile intertwined with light malt, oak, and fermentation notes, while older bottles lean more heavily on the fermentation notes as the yeasts and bacteria develop. I'd add that this vintage has a level of acidity that would be entirely familiar to a wine drinker--that is to say, it adds structure and provides liveliness, but does not dominate the beer. Pathways has a refreshing fruitiness, a woody undercurrent that harmonizes with herbal, almost savory, notes. The alcohol (8%) is entirely hidden, dangerously, because it has a moreishness that encourages fast drinking. It wasn't that long ago that brewers started exploring wild saisons, reaching back toward the original farmhouse ales of the Hainaut. The use of wild yeast and bacteria, barrel-aging, and blending is evocative of those old rustic brews, but in reality, I doubt any farm was ever visited by something like this. Farmers used to brew what they had grown, often on equipment that was put into service infrequently. They weren't professional brewers, and they didn't spend a decade doing nothing but working with these beers like Upright has. We may romanticize the past, but agriculture was hard work and it's hard to see how the farmers could have developed the skill to work with these difficult beers and make something like modern brewers can. I do think brewers like Alex Ganum at Upright were inspired by the historical record, and found in the old descriptions guideposts that led them to creations like Pathways—but these are surely better beers. Pathways saison is the result of an accretion of knowledge Americans have gathered, collectively, over the decades. Ganum brewed at Ommegang and later at BJ's in Portland, where Dan Pederson was nurturing his own love of saison. Upright made great beers from the start, but Pathways represents a level of mastery that only comes from time and practice. 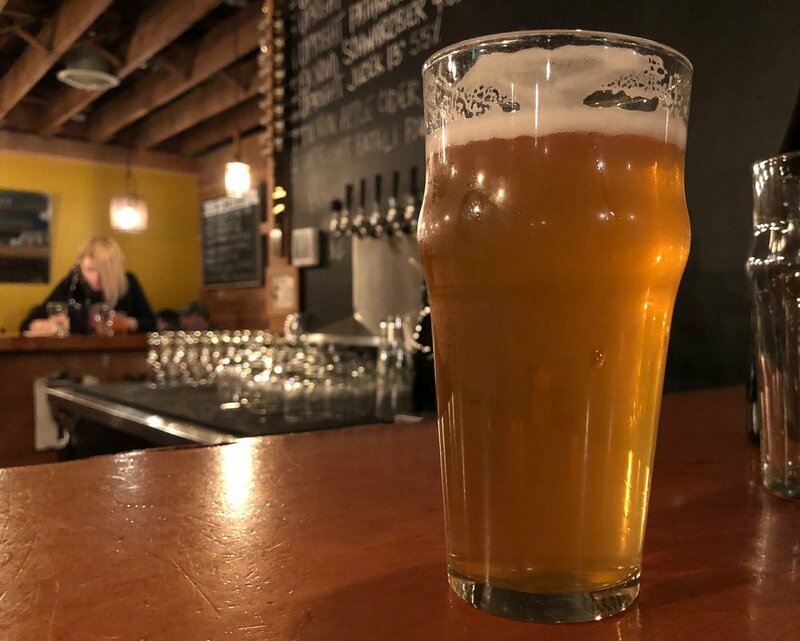 Breweries share information and the industry has moved forward; meanwhile individuals brewers at places like Upright spend years (and eventually decades) honing their craft. There's an old story about how a tadpole in a pond believes his watery world to be immense until he turns into a frog and discovers the forest beyond. When I was sitting in that brewpub back in 1990, thinking I understood beer because of the distance between amber ale and Oly, I was the tadpole. I don't love being an old-timer, but it's wonderful to have lived through this evolution. A frog more deeply appreciates the forest for having once believed his little pond was the universe. You can still get Pathways by the pint at Grain and Gristle, and I highly encourage you to do so. (Although not obviously labeled as such, consider this a Beer Sherpa Recommends.) After it departs draft accounts, you'll have to stop by the brewery to pick up a bottle. Either way, this one is worth seeking out.